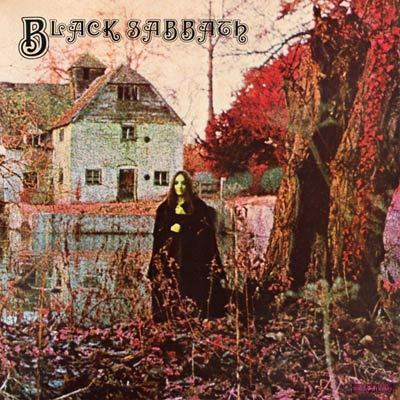 Black Sabbath Releases "Black Sabbath"
Black Sabbath is the debut album by the British rock band Black Sabbath, released in the United Kingdom on Friday the 13th, February 1970. Black Sabbath is often regarded as one of the first heavy metal albums. Musically and lyrically the album was considered quite "dark" for the time. The first song on the album is based almost entirely on a tritone interval played at slow tempo on the electric guitar. The song's lyrics concern a "figure in black" which bass player Geezer Butler saw after waking up from a nightmare. The album cover features a depiction of Mapledurham Watermill, situated on the River Thames in Oxfordshire, England. Standing in front of the watermill is a figure dressed in black robes. This is perhaps an allusion to the lyrics of their eponymous song: "A figure in black, which points at me". On the original release, the inner gatefold sleeve featured an inverted cross with a poem written inside of it. Vertigo, the band's record label, was allegedly responsible for adding the cross. The band was upset when they discovered this, as it fuelled allegations that they were Satanists or Occultists. The album was not packaged with a gatefold cover in the U.S. Released on Friday the 13th February 1970 by Vertigo Records, Black Sabbath reached number eight on the UK Album Chart. Following its US release in May 1970 by Warner Bros. Records, the album reached number 23 on the Billboard 200, where it remained for over a year, selling a million copies.